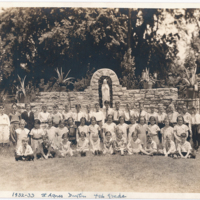 The graduates of Our Lady of the Holy Rosary in Dayton in 1921, taught by Sr Julienne Marie. 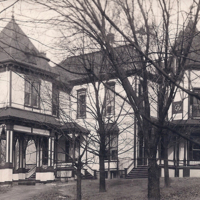 The Sisters began teaching in 1889. A view of the new convent of the Sisters teaching at St Helen School in Dayton, Ohio. 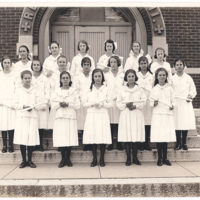 The Sisters began teaching at St Helen's in 1954. 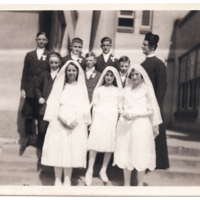 A group of students from St Agnes School in Dayton who received their First Communion. A view of the school building at St Agnes in Dayton, Ohio. 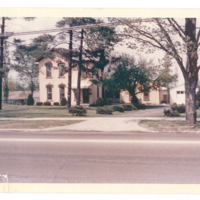 The Sisters began teaching at the school in 1904. The 4th Grade Class at St Agnes from the 1932-1933 school year. 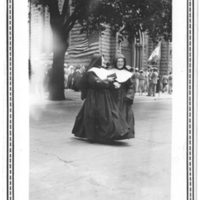 Two students in the photo would eventually become Sisters of Notre Dame. 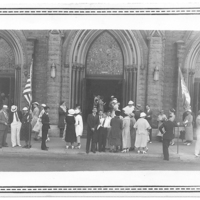 A view of parishioners of Holy Trinity in Dayton after an important church event or celebration. 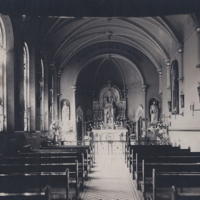 Holy Trinity Parish was founded in an effort to address the overcrowding at Emmanuel Church around 1860. 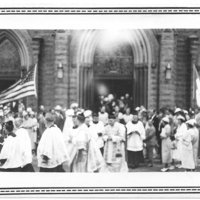 A view of an important event or celebration at Holy Trinity in Dayton between 1920 and 1930. 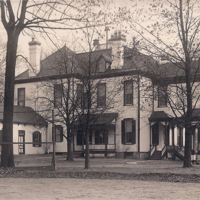 The Sisters taught at the school, beginning in 1861. A view of the convent chapel on the first floor of the Holy Family Convent in Dayton. 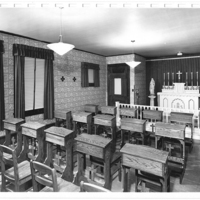 The convent was renovated in 1954 to create more space for the Sisters teaching at Holy Family School. 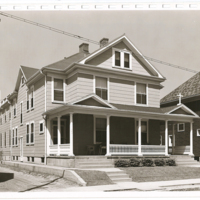 A view of the front of the renovated convent used by the Sisters at Holy Family Parish in Dayton, Ohio. 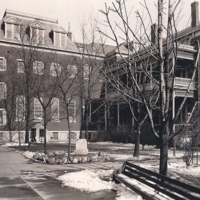 Although the Sisters taught at the school when it opened in 1907, the Sisters moved into the convent in 1926 from the convent on Franklin Street. 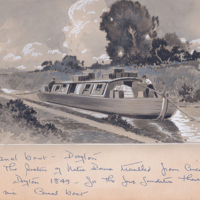 A painting, likely drawn by a Sister or a student, depicting the method of travel used by the first five Sisters to arrive in Dayton in 1849. 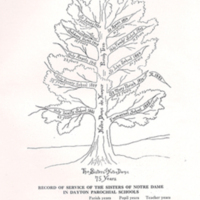 A drawing of a tree used to demonstrate the impact and reach of the Sisters in the parishes of Dayton since their arrival in 1849. 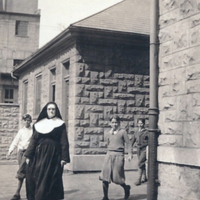 Sister Marie Terese with the boys of Emmanuel parish school, located across the street from the Franklin Street Convent. 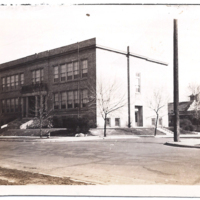 Sister Marie Therese taught the 7th and 8th grade boys from 1931-1935. 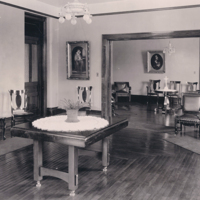 A parlor room used by the Sisters in their convent on Franklin Street. 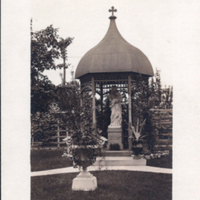 An interior view of the convent chapel with the statue of St Julie below the statue of Mary. 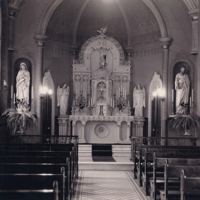 An interior view of the convent chapel.